Born March 11, 1952, Melbourne. Died November 16, Sydney. A fitting tribute from The Australian. WHOEVER you talk to, the message is the same: literary and arts journalist Andrea Stretton was a warm and generous woman who poured hard work, intellectual rigour, a passion for life and integrity into the arts, particularly in the world of books and Australian literature. "Her interview techniques and preparation were beyond compare," says Melbourne theatrical producer and literary agent John Timlin, who represented her at one stage of her career. The Books Show, which Stretton co-hosted on SBS with Dinny O'Hearn, greatly lifted Australians' appreciation of books, he says. "It gave books a national prominence that they had not had before. Whenever I think of her interviewing people I think of how brilliantly she got them to talk about their lives, not just their books. Her interests were so eclectic and she had a simpatico personality." Stretton was born in Melbourne, the youngest of three siblings: she had two older brothers, John and Peter. Her father, also John, was a banker with an interest in history. Her mother, Dulcie, was a great reader who championed libraries, later in her life school libraries in particular. Stretton received a BA from La Trobe University and joined SBS in 1985. She was heard on SBS Radio before being seen on The Book Show and, subsequently, on other arts programs, including Masterpiece. She had on-camera and behind-the-scenes roles. 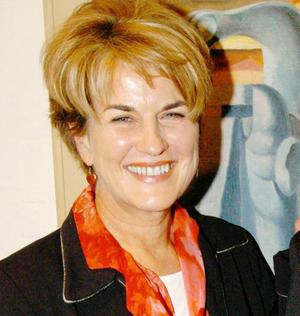 In 1998 she moved to ABC Television to present the Sunday Afternoon arts program. While at the ABC, she acted as artistic director of two of the arts festivals held in the lead-up to the 2000 Olympic Games. "I think it was a very enriching experience for Andrea because it took her beyond literature and the media," says Donald McDonald, director of the Office of Film and Literature Classification, who was then chairman of the Cultural Commission for the Sydney Organising Committee of the Olympic Games. "She was wonderful to work with and she was exactly the same as her public persona. I think it was one of the keys to her success as a broadcaster: she really was being herself." It was during Stretton's first arts festival in 1998 that she commissioned David Handley to create the annual Sculpture by the Sea exhibition in five locations around Australia. "She took a punt on me," says Handley. "I know a lot of people thought she was mad giving the commission to a 31-year-old guy who had only produced a one-day event in Bondi, and the knives were being sharpened in case I failed. But we got 200,000 people to those exhibitions." On Sunday, the closing day of the 11th Sculpture by the Sea, the staff wore black armbands in honour of one of their biggest supporters and their MC for the past eight years. "Mistress of Ceremonies was the title she loved. She was so laid-back and had such a cheeky humour," says Handley. After leaving the ABC in 2001 - a tumultuous period at the national broadcaster and for her when it didn't renew her contract - Stretton presented seminars and conducted interviews with writers for festivals, cultural groups and libraries, and wrote reviews for various newspapers and journals, including Art & Australia. She combined her passion for and knowledge of the visual arts with her love of literature through lectures at galleries. For several years she gave short courses on writing and literary appreciation at Daku Resort in Fiji. She was there in October when she became ill.
"She did so much for writing and writers in this country and so much of it was unsung," says Lyn Tranter, proprietor of Australian Literary Management. Tranter says today some literary interviewers fail to read the books of the authors they are interviewing; this would never have happened in Stretton's interviews. "She was utterly wasted and abandoned by our two national broadcasters and I think they should be held accountable for that," Tranter says. The French were less remiss. They made her a Chevalier des Arts et Lettres, the country's highest award for the arts in 2002. Two years previously, Stretton had made Bouillon de Culture, a co-production between the ABC and France Television. Showcasing well-known Australian arts figures, it was shown in French-speaking countries around the world as well as in Australia. In presenting her with the award in Sydney, then French ambassador, Pierre Viaux, called Stretton "a wonderful advocate of cultural diversity and a powerful ambassador for Australian culture in this country and around the world". While her friends and colleagues comment on her warmth, they also leave no doubt that she was not soft as an interviewer. Says Sydney bookshop owner Lesley McKay: "She would draw them out on subjects that they did not want to talk about. I have seen her really challenge a lot of people. If she had a point she wanted to get out of them she would. But she was not aggressive. She was feisty, talented and gorgeous." Stretton worked part-time in McKay's bookshop after leaving the ABC. While there she and McKay cooked up a scheme to hold monthly literary interviews at the Woollahra Library. They have been running for the past four years. "She had such a fan club," says McKay. "She really was the most gifted interviewer. She made guests so relaxed and drew authors out on all sorts of issues whether it was Kate Grenville, a writer who had just been published for the first time, or an academic. We are all completely devastated. The whole book trade is." Stretton died in Sydney's Prince of Wales Hospital on Friday from lung cancer after a brief illness. She was 55. She is survived by her partner Alan Krell, son Jake, and a granddaughter. And from the Sydney Morning Herald from wheree the above pic was taken.